The National Farmers Union (NFU) Thursday told the Department of Agriculture U.S. meat labeling standards are disadvantaging U.S. beef producers by allowing products born, raised, or slaughtered outside of the United States to carry the “Product of the U.S.A.” label. NFU wrote to USDA’s Food Safety and Inspection Service, that the standards “need to be changed immediately.” The NFU action supports a petition by the Organization for Competitive Markets and American Grassfed Association. 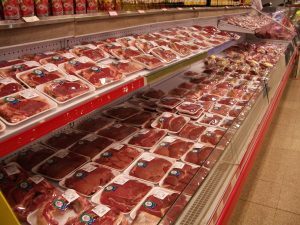 The petition says that FSIS should change current regulations to require that beef be of domestic origin to be eligible for the “Product of the U.S.A.” label. NFU President Roger Johnson says the labeling standard also “misleads consumers.” Johnson noted that NFU has long been a proponent of mandatory country-of-origin labeling for agricultural products as a means to ensure consistent labeling for the benefit of American family farmers and consumers. Yet COOL was repealed in 2015, and the voluntary “Product of U.S.A.” labels do not provide consumers with accurate country-of-origin labeling.